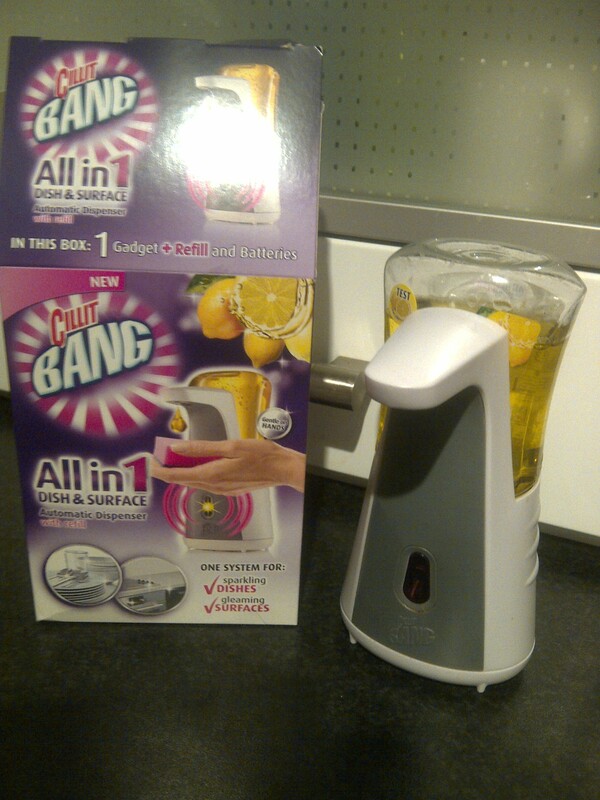 Cillit Bang have just launched their pioneering new kitchen dispenser, the All in 1 Dish and Surface Cleaner and I have been lucky enough to put the new product on the cleaning block through its paces. This is the only product on the market that cleans both dishes and cleans surfaces and leaves everything gleaming! It really does take the hard work out of cleaning, the system really could not be easier to use. Simply hold your scourer or dishcloth up to the sensor on the dispenser and a level amount of the liquid is dispensed for you to start cleaning. The motor in the dispenser makes a whirring noise before the product is dispensed so you are not taken by surprise. With a 3 year old in the house, I find myself cleaning the kitchen surfaces and cupboard doors constantly due to mucky fingerprints. The handy dispenser easily sits by my sink and does not look out of place in the kitchen. With one simple reach to the dispenser I am ready to get cracking with wiping up for a sparkling clean. Washing dishes is made very simple and I have found that a little really does go a long way as the liquid is measured out perfectly. We were sent the dispenser and refill box as a starter pack, refills can also be purchased separately. Let them cool on the baking tray for a few minutes then transfer to a wire rack to cool completely. The biscuits really were a great success, they were very crunchy and had the texture of chunky cookies. I am a huge fan of ginger biscuits and next time we make them (the ingredients are cupboard staples!) I think I shall add a little more ginger for my personal taste. Although not incredibly mess to make, my kitchen surfaces did need a wipe down to the flour I used to coat them. It did make it easier to bind the biscuit mixture together. I can categorically say the Cillit Bang All in 1 Dish and Surface Cleaner is something everything kitchen needs, it really does make cleaning easier and allows you more time to spend having fun with your children and baking! Competition closes at midnight on Friday 16th March – winners will be chosen by random.org and will receive a winning email. The answer is Holly Bell.